December 21, 2012 marked the winter solstice. So I can bear the cold months ahead knowing every day gets a little bit lighter, brighter, longer and warmer. I’ll have this centerpiece to see me through the cold dreary months ahead. Here’s to the summer solstice – the longest day of the year will fall on June 21, 2013! 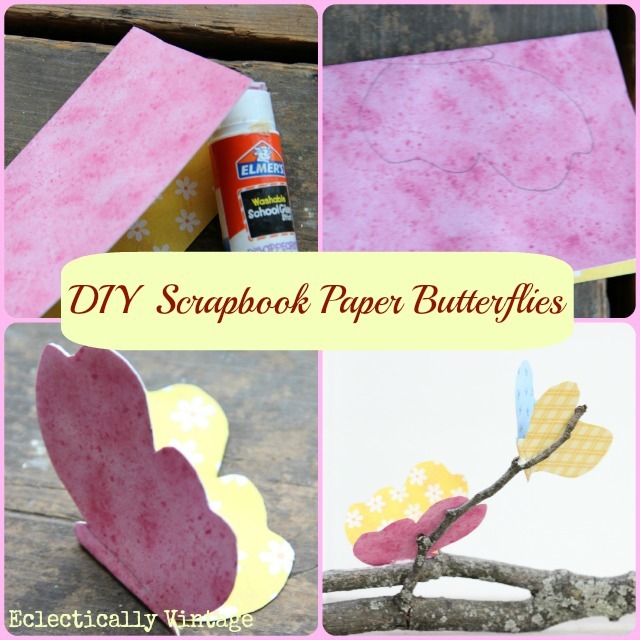 In the meantime, here’s to cute butterfly projects and using up my piles of scrapbook paper. Check out all of My Projects here for more simple ideas. your butterflies and Kariannes birds should hook up, they would make beautiful babies! Looks like spring to me! Happy Monday, Kelly! Here’s to summer solstice is right! I think that’d be perfect on an Easter table!! Cute idea. Very warm here over the weekend. I LOVE this Kelly! What a beautiful centerpiece!Now I need to find a branch! Have a great day! so cute! you are ready for winter to be over, huh? Super cute Kelly! We are over the hump. I’m loving a little longer day myself. 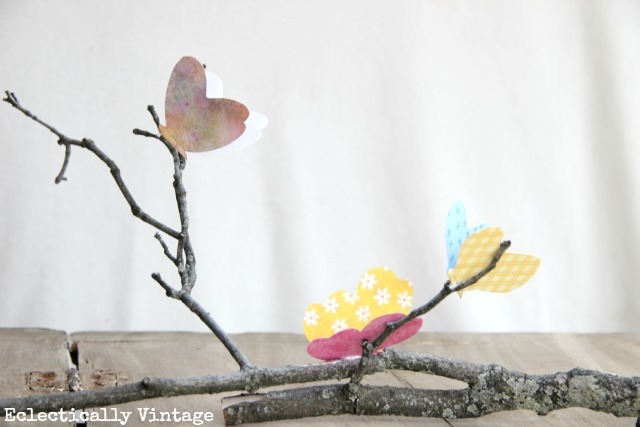 Love this, the butterflies are so cheerful – I think I could use a few around here. I have a little abandoned nest right outside my door. Easy to find branches. What a sweet idea! Thanks for sharing, looks like Spring is in the air now! What a fun idea! I am so ready for longer days, too! The better light to photograph with….LOL! I love the butterflies! Spring is my favorite season, and this would be a nice reminder that it’s around the corner. 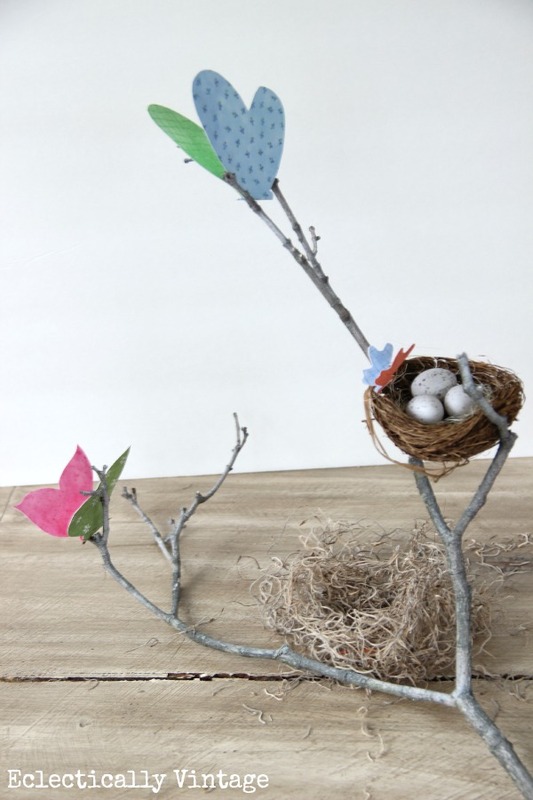 You are always “branching out” with the cutest ideas! !…Great butterflies Kelly!!…. This is so pretty kelly! 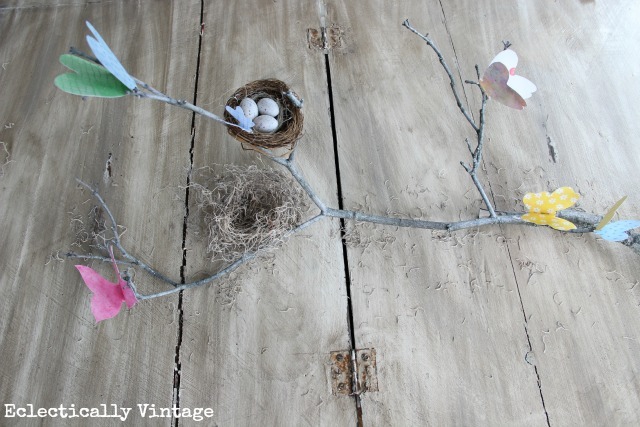 it has been so warm here this week that I have spring on my mind and this is just perfect! What a great idea.. I look forward to seeing you at My Dream Canvas. I am visiting you from Tuesday Treasures. Thanks Anu! So sweet, love your butterflies! It is beautiful, Kelly! Can it be spring now, please? I’m already doing step #9, so I feel like I pretty much accidentally already did this project. 🙂 It’s LOVELY. So happy and fresh! So cute! It’s the perfect reminder of spring to come! Pinning!